Sunlight filtered in through the cracks in the drawn curtains, and Zelda’s eyes slowly fluttered open. It took a moment before the memories of the night before came to her. She and Link had stayed up late into the evening, not really talking, just staying beside each other as they watched the moon rise high into the sky. The only thing they had discussed was leaving in the late morning to get some fresh air away from the castle. With a temporary guard placed out her door, she had finally crawled into bed, too tired to even worry about the possibility of the nightmares that normally plagued her sleep. By that time it was well into the early morning. She yawned, stretching her arms above her head before she climbed out of the comforting warmth of her bedding, a shiver coursing up her spine as her bare feet met the cold flooring. She bathed quickly and dressed in her black pants and blue and white tunic and gazed at herself in the mirror. Her reflection stared back, and in it she could see the small bags under her eyes had faded a little, and her complexion wasn’t quite so pale. She realized her sleep had been uninterrupted, and no bad dreams had jolted her awake. She couldn’t remember how long it had been since she had slept so soundly in such a small amount of time. As she tugged on her leather fingerless gloves, memories flooded her mind as she took one last glance at herself in the mirror. She had worn the same uniform one hundred years ago, when she and Link had gone looking for the shrines. One hundred years later, and they were still using the same uniform. She wasn’t sure if that was from a sense of tradition, or if the seamstresses were trying to comfort her with the familiar. Funny, how so many different memories could be embedded into something so simple as an outfit. Recollections both good and bad flitted through her mind. A wistful smile tugged at her lips as she thought of when she had tried to get Link to eat a frog in order to help with an experiment. Poor Link hadn’t known how to react, and lucky for him, she had tripped and the frog had leaped to safety before she could get it anywhere near Link’s face. She shook her head to dissipate the memories and took her time braiding her hair, leaving it in a single plait down her back. She had never really worn her hair like this, but maybe today was a day for trying new things. With that thought in mind, she tugged on her leather boots and hurried down to the courtyard, a warmer smile spreading across her face. She quickly found Link and Williams in the middle of a conversation by the stables, two horses already saddled and ready to go beside them. “You take care of our princess, Champion,” Williams admonished, only semi-playfully. “I know Calamity Ganon has been sealed, but there’s still plenty of his minions running around. And the Yiga Clan are still out and about, from what I’ve heard. But, that being said, I think it’s good for her to get out of the castle. She needs it.” He ran a hand through his sparse gray hair. While Zelda could see the tired lines on his face, his eyes still sparked with enthusiasm. Even with a large workload, the man still flourished. She could only hope she would be the same way one day. Her boots crunched on the gravel, and Williams fixed his posture at her approach. “Your Highness, good morning.” He smiled at her cheerfully. Her adviser cut her off, shaking his head. “Don’t worry, Your Highness, it’s all being taken care of. Just go out and enjoy yourself. In fact, if you’ll excuse me, I’d best get started on my own tasks as well…” He bowed and hurried away. Zelda watched him go, then turned her attention back on Link. He was staring at her, watching her every move, and she fought a blush that threatened to make its appearance known. “So, where are we going?” she asked, stepping towards the horses, Link beside her. “Where do you want to go, Princess?” he replied, peering at her from the corner of his eye. He bobbed his head up and down, his apple clenched between his teeth. Zelda watched as Link ran his hands up and down his horses’ legs, checking the straps on the saddle to make sure everything was as it should be. “Kuro looks pretty happy to be out and about,” Zelda laughed slightly, watching as the beast turned her head to knock her muzzle into her masters arm, wanting his attention. Zelda nodded and they both mounted up, spurring their horses forwards at a brisk walk. Once they were through the castle gates, she turned in her saddle, taking in the sight of her home behind her. The castle walls still stood tall, though certain pathways had yet to be cleared of rubble. The gaps in the walls had been fixed rather quickly, and all the burned remnants of the cottages surrounding the area had been cleared away, yet there was still much work to be done. Everyone was working almost around the clock to get the castle back in working order. It would still be some time before it began to feel like the Hyrule castle she remembered. It may have been a hundred years, but thoughts of the sun rising above banners flying from the tallest towers blurred her vision as sharply as if it had been just yesterday. Blinking the tears away, she swallowed at the lump in her throat and nodded silently as they rode on. They rode in comfortable silence for awhile, the sun beating down on their skin and warming their chilled fingertips. A slight wind brushed past them, setting the long grass and flowers swaying to an unheard song. “We’ll pass through Kakariko Village soon. There’s a great overlook just to the left of Lanayru Road’s West Gate,” Link murmured, his voice soft as they passed Dueling Peaks Stables. As they approached the stables, Zelda watched as two children chased each other with sticks, their giggles and happy shrieks piercing the air. Her wistful smile returned as she watched them play together without a care in the world. The stable hand waved familiarly to Link, who inclined his head in return as they rode past. The horses’ hooves clopped loudly on the stone bridge they crossed, and a girl of about Zelda’s age stood off just to the left. The girl turned as she heard their approach, a huge, somehow strange smile plastered to her face as she began walking up to them. Zelda could see Link tense and watched as his right hand reached toward the sword strapped to his back. “Link…!” Zelda whispered, alarmed by his sudden, harsh reaction. His hardened gaze never left the girl as she stood right in front of his horse, the smile still on her face in a way that didn’t come anywhere near her eyes. “Hullo, there! I’m kinda lost. Would you be able to direct me towards Hyrule Castle? I hear the Champion is back, and, well… It’s a long story.” She blinked up at Link, taking in his blue tunic and hand fastened around the hilt of his sword. He remained quiet, his eyes narrowing slightly. “Although it looks like I already found him.” A malicious grin replaced the creepy smile on the girl’s face. “Which is good. Cause I have a score to settle with you, Champion!” She leaped backwards and a puff of smoke covered her for a moment. Once the smoke dissipated, it was obvious the ‘traveler’ persona had all been a ruse. The red uniform and ivory mask of the upside down Sheikah symbol designated her as part of the Yiga clan. In her hand, a vicious sickle glimmered flawlessly in the sun, begging to cut deep into the flesh of its enemy. Slung across her back, a bow and quiver of arrows hung in wait. Leaping down from his horse, Link unsheathed his sword and crouched into a defensive stance in one smooth motion, placing himself between the Yiga girl and the princess. Instantly the girl darted forward, her scythe sweeping viciously from below in an upward slash aimed for Link’s chest. The clash of steel rang out as scythe met steel instead of flesh. The sudden ferocity of the strike sent vibrations racing down both opponents’ arms, nearly making Link drop the weapon he barely parried with. Twisting his wrist, he shoved the scythe away and jumped backwards to increase the space between them, tightening his grip on his sword and finally drawing his shield. Smoke surrounded the girl again, allowing her to vanish from sight. Zelda glanced around wildly and her horse shifted underneath her, picking up on her terror. Link remained in place, his eyes darting from side to side, the girl’s taunting laughter encompassing them. She appeared a moment later behind him, seemingly suspended in the air. Her bow was stretched taut and the bowstring twanged as she let the arrow fly. Link quickly turned and blocked the arrow, which pinged away harmlessly. Before he could go on the offensive, the girl had disappeared from sight once again. “You seem to be a bit rusty there, Champion,” she mocked. “You’ll never catch me at this rate.” Her laughter rolled over him and Zelda could see the slight frustration that coursed through him. Zelda gasped and Link spun around. She sat rigid on her horse, her throat bobbing nervously underneath the blade that was held there. The Yiga girl had one arm wrapped around the princess’s waist, her sickle dangerously close to drawing blood. “Link…” Zelda gasped, her green eyes wide in fear as sweat began to trickle down her back. “What’s the champion going to do now?” The girl sneered at Link before turning her attention to Zelda. “And you… the little helpless princess. The princess who ruined everything.” Hate radiated off of the girl, and Zelda fought the trembling of her body. Link’s eyes met hers and he gave her a slight nod. She watched as his fingers inched slowly to a dagger strapped to his belt, his eyes never leaving hers. “You can’t do anything to save her, Champion. If you move even an inch, I’ll slit her throat. Or maybe I should take her with me to our hideout? Make her death slow…” Zelda could hear the smile in the girl’s voice and her throat bobbed nervously. Link’s eyes flashed. As the blade pressed against her skin, her breathing came faster and faster. The feeling of helplessness overwhelmed her, and all awareness of the world around her vanished completely. Thoughts of the blade against her neck, the fear in Link’s eyes, the cruelty of the Yiga girl’s laughter, the unsteady motion of Eos below her, all whisked away in an instant as her mind filled with just one panic-stricken thought: It’s happening again. The earth rocked beneath her as she and the Champions rushed to the castle. Zelda had refused to run and hide, like they had suggested. She was tired of feeling useless. Maybe she couldn’t summon her power like the legend required, but surely there were other ways she could help. She wasn’t exactly sure how, yet, but she would form a plan when the time came. For now, the first step was just getting to the castle. All too soon, it was time to part ways with her beloved Champions. They stopped just before the road that lead to Hyrule Castle and she turned and looked at them each in turn. “Well, this is it. Don’t worry your head, Princess. Calamity Ganon doesn’t stand a chance against us!” Daruk exclaimed, a grin slitting his mouth wide. Revali simply smirked, his feathered arms crossed. The Champions nodded and hurried off, though Urbosa waited with her, watching as they vanished from sight amidst the smoke and dust. The tall Gerudo woman turned, studying them both. “I’m scared, Urbosa… what if I fail? Just like the last three times?” Tears formed in Zelda’s eyes again, trickling down her already dirty cheeks as she watched the chaos around Castle Town. “I know you’re scared, Little Bird,” Urbosa wrapped an arm around the princess’ frail shoulders. She wished there was something she could say to help quell the fear and worry that surrounded Zelda, but instead opted for, “Your mother would be so proud of you, just as I am.” She stepped back from her, memorizing every line of her face, the green of her eyes, the golden color of her hair, the lilting tone of her voice. She knew she may never see her Little Bird again, and while it killed her inside, she knew if she showed an ounce of her fear, Zelda would truly think all was lost. He nodded once, his expression unreadable. Urbosa stepped forward, kissing Zelda’s forehead to cut her off. “I love you, Little Bird. Your mother and I are so very, very proud of you, no matter what happens. Always remember that.” She turned and started running away to the southwest, before Zelda could reply further. Things had gone awry far faster than Zelda could imagine. As she and Link raced through the streets, pushing their way through the crowd to get to the castle, the Guardians had turned on them. Infected by Calamity Ganon’s Malice, there was nothing they could do to regain control of the machines. Beams shot from their mechanical eyes, decimating the buildings and homes around them, sending rock and debris flying. Zelda’s ears rang from all the screaming, and her heart pounded in her chest. These were her people! These were her people and she couldn’t do anything to save them! A sob gathered in her throat but she forced it down, pushing forward towards the main gates of the castle. Her father, the King of Hyrule, was there, sword in hand, surrounded by knights as he fought off a rush of Bokoblins. Just as the final Bokoblin fell, a Guardian lumbered close by, its head swiveling. “No…” Zelda gasped as the Guardian set its attention upon her father and lumbered closer to him. “No, no, no!” She began running, tripping over her dirty skirts and tumbling to her knees. Link was there in an instant, kneeling beside her but she didn’t notice him. Everything seemed to slow down around her and she watched in horror as her father met the machine head on, he and his knights hacking away at it’s legs to no avail. The Guardian scuttled backwards and trained its laser on the king. He froze, seemingly to know as if his end was here. “FATHER!” Zelda screamed, her voice frantic. He turned his head and his eyes met hers in surprise. Then his expression softened, and he smiled sorrowfully at her. He opened his mouth to say something, and then the world exploded around him. Link threw himself on top of her as rubble went flying, debris crashing around them. Zelda’s ears rang, and everything was muffled and quiet around her as she stared at the spot her father had been moments before. As her hearing slowly returned, the sound of wailing filled her ears. 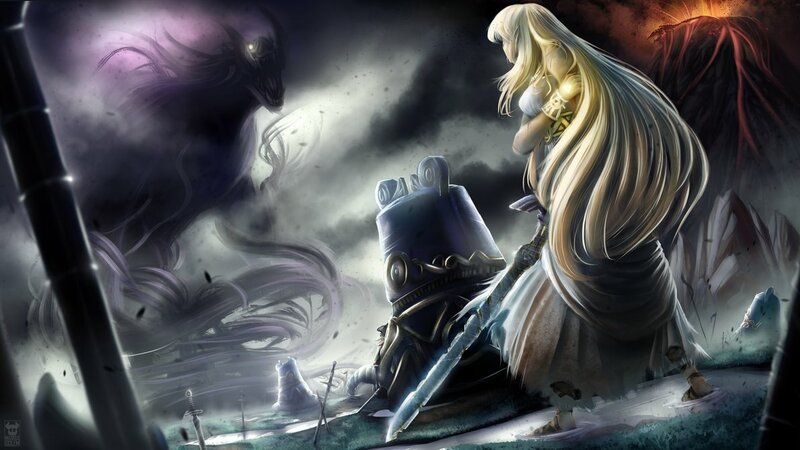 Link grabbed her arm, tugging her along as the Guardian spun its head around towards them. Time seemed to slow to a stop as Zelda looked down, seeing the red laser lock onto her chest, and in some other world she could hear Link yelling at her to get up, to move, to run. To do something. Anything. But she couldn’t focus, or get her legs underneath her. She knelt, frozen to the spot, her mind deathly quiet. Everything around her was falling apart. She was about to die. She was about to die, and everything she had done up to this moment had been for nothing. If she survived this, she truly would be the heir to nothing. And yet even that realization didn’t move her. She stayed frozen, unable to act, unable to think, unable to care. Suddenly Link was in front of her, the Guardian’s beam racing towards them. Time seemed to warp again as with a deft movement, Link used his shield to deflect the laser back the way it came, exploding into the Guardian. The sound of grinding gears met her ears and the pink lights scattered across her vision flickered out. “Princess, come on! We need to go!” Link grabbed her by the arms gently but firmly, hauling her to her feet. Shaking her head firmly, some of the fog in her brain began to clear, though much remained, making it hard to gather her thoughts. She knew it was shock that was setting in. And shock could kill. “What happened?” She asked, letting him drag her away from the felled Guardian, back towards the gates leading away from the castle. “The Divine Beasts are down,” he said simply, though she could hear the slight crack in his voice. “W-what? What do you mean? !” She exclaimed, looking in the distance to where the Divine Beasts were standing. The once blue lights now glowed pink, infected with the Malice just like the other machines. She choked back a sob. This can’t be happening, she thought, the screams of her people echoing in her ears as they ran. I’ve failed. I’ve failed them all. With that thought, rain pouring down around them and fires raging, she and Link escaped through the forest. Zelda’s memories rushed through her, over and over again, forcing her to relive those terrible moments again and again, ripping open the scars on her mind that she had thought had begun to heal. Useless. Hopeless. Failure. Worthless. She couldn’t do anything. Anything at all. Maybe if she had trained with Link, or wasn’t so dependent on him, she could get herself out. She was so pathetic. She had sat by and watched as Link died. Yeah, she was able to finally harness her power and get him back, but what did she really do against Calamity Ganon? She let Link deal with her problems, the big ones, the small ones, all of them, it felt like. Even now, with a knife at her throat, a simple flick of the wrist away from ending her entire worthless life, she was sitting here, waiting like a duck in the water, for him to come save her. Again. A rage unlike any she had felt before kindled in Zelda’s chest, snapping herself from her memory. It grew inside her, fed by her uselessness, her worthlessness, her inadequacies, her shortcomings. Was she always going to need Link to save her? She was born to be a Queen. What kind of Queen could she be to her people if she froze like a startled deer the second an enemy came along? Her gaze drifted back to Link, at the concern etched into his sharp features. She could see the gears turning in his head, trying to solve the puzzle of how to rescue her. Again. Did he ever get tired of it? Rescuing her, again, and again, and again? Anger coursed through her veins, red hot and burning. She knew she was tired of it. She was tired of having to rely on someone else to help get her out of whatever predicament she was in. Link’s eyes met with hers, widening slightly with surprise as he saw something in her expression. While her fear was still there, just underneath the rage, she knew what she had to do next. A decision had snapped together in her mind, and she followed it without hesitation. She couldn’t fear the consequences. She couldn’t think too much. She couldn’t keep waiting, helpless, for her hero. She took hold herself. She brought her head forward slightly, feeling the sting of the sharp blade against her neck as her blood trickled down her clammy skin, before ramming her head back into the girl’s nose. The girl yelped in surprise, bringing up the arm that had been wrapped around her waist to her gushing nose. The other hand loosened slightly on sickle, and Zelda took the opportunity to jam her elbow into the girl’s stomach. The girl gasped and Zelda yanked on the reins. Eos reared up, whinnying loudly as the girl slid off and landed with a loud thud onto the hard packed ground. Zelda spun her horse around to face the Yiga girl, and her mount reared once again, clawing at the air in front of her. Her hooves came down fast and the girl rolled out of the way just in the nick of time. The Yiga scrambled backwards and stumbled to her feet, one arm wrapped around her throbbing stomach and the other trying to stop the blood that still leaked from her broken nose. “Don’t think this is over, Champion.” Her eyes blazed as they met Zelda’s. “The Yiga will find you. We’re always watching.” She disappeared in one last puff of smoke, and everything was quiet. The princess and her champion stared at each other quietly for bit. Zelda’s limbs began to droop as the excitement finally faded, leaving her feeling weak and a little sick. Her hands trembled and she gripped the reins tightly. Link shook his head as if to break himself from a daze and hurried over to her. Link studied her for a moment before nodding in agreement and mounting up. The rest of the ride was uneventful as they made their way through Kakariko Village to Lanayru Road. They took a left at the split through the short canyon and made their way to a thick copse of trees, dismounting and letting their horses graze freely. Mezza Lo Shrine rested upon a slight hill to the right, and a small pond with deer resided on the left hand side. Link lead her to a precipice just beyond the pond and sat down, patting the rocky ground beside him silently. Zelda’s breath caught in her throat as she stared out over the view. Lanayru Wetlands sprawled before them, and just beyond, Hyrule Castle rose above, the peaks of its turrets piercing the golden sky. To the right, she could see the blue glowing veins that twisted through the region’s tower, reaching above the Tabahl Woods. She could just make out the sparkling waters of the Zora River as it wound its way through the mountains and paths leading to the Divine Beast, Vah Ruta. The various landscapes stretched as far as the eyes could see, and Zelda’s breath caught in her throat once again. Link didn’t say much, preferring to let the landscape do the talking for him. Zelda slowly sat beside him, glancing at him. She didn’t really know what to say, if anything. She wasn’t sure if this was where she thanked him for getting her out of the castle, or apologized for everything she had put him through. Words failed her, leaving her with a silence that reminded her yet again of just how cowardly she truly was. She turned her eyes back to the scenery, fighting to regain her voice. But it was he who spoke first. “That was brave, what you did back there. I don’t think the Yiga girl was the only one that was surprised.” He turned to her with a soft smile. “I was just tired of expecting someone else to come save me,” she replied. “Of you to come save me.” Link remained quiet, waiting for her to continue. “I think I’m the weakest out of all my ancestors before me. Each princess stood for what she believed in… Even Princess Zelda from the time of Twilight wielded the Bow of Light. And while she may not have defeated Ganon entirely by herself, she still helped. She didn’t hide away, like I did.” She choked on the tears that tried to claw their way up her throat, swallowing against them. “No,” she interrupted, her eyes blazing in shame. “No, I did nothing. I let you shoulder the burden. I almost got you killed the first time, and if you hadn’t made it back, if the Shrine of Resurrection hadn’t worked…” She choked again, and this time tears spilled down her cheeks. “I was a coward. And I don’t know if I can come back from all this… this shame and guilt. What if I’m too far gone?” She turned to look at her champion, only to find him already watching her with a look in his eyes that she couldn’t even begin to comprehend. “You’re never too far gone.” He wrapped his arm around her shoulders, and the dam that had been holding all Zelda’s tears at bay finally splintered and broke. Her shoulders shook as she cried, hiding her face into Link’s shoulder.